The Shield Reunites After WWE RAW, Dean Ambrose Takes A Bow, Roman Reigns' Reaction (Video) - Wrestling Inc. The dark segment after RAW saw Rollins address the crowd and acknowledged that they were pissed off with the main event, the "Winner Takes All" match with WWE Champion Kofi Kingston that was interrupted by The Bar. Rollins then called Kofi a pioneer and a trailblazer and generally put him over to get the crowd back on his side. Rollins then brought Roman Reigns out, initially to boos, until Rollins reminded them of the leukemia battle Reigns recently returned from. Rollins then called Ambrose to join he and Reigns in the ring for a proper sendoff. Ambrose came out with a water bottle that he was spitting tobacco into. Rollins put over how much he's learned from Ambrose as the fans chanted for him not to leave. Ambrose said that the best thing he's ever seen in WWE was Rollins stomping Lesnar's "dumb, lunchbox head into the ground and take the title back for the boys." Ambrose then praised Reigns for beating "the s--t" out of cancer. Ambrose added that they debuted at the arena and Arn Anderson called them "two indie schmucks and a football player." Ambrose said that a building is just a building, it's the people who fill it that matter. Ambrose then took a few bows for his farewell. 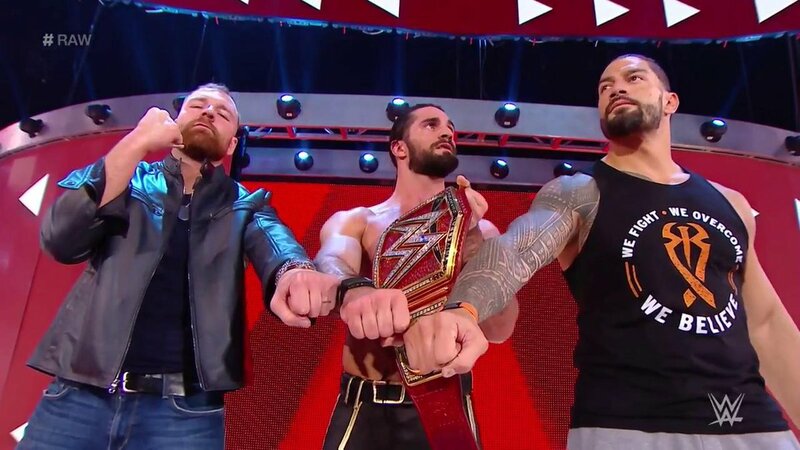 The Shield ended the segment with their signature fist bump as their music played to send everyone home. He then brings out Reigns who... GETS BOOED! During the #RAWAfterMania dark segment Rollins asks Ambrose to join he and Reigns in the ring for a proper sendoff. Dean comes out, with a water bottle he's spitting dip into. Rollins puts over how much he's learned from Dean. The fans chant for Dean not to leave. Dean Ambrose's final comments following #RAW feature him saying the best thing he's ever seen in WWE was Rollins stomping Lesnar's "dumb, lunchbox head into the ground and take the title back for the boys." He praises Reigns for beating "the s--t" out of cancer. He adds that when they debuted at TLC Arn Anderson called the SHIELD "two indie shmucks and a football player". He says a building is just a building, it's the people who fill it that matter. They end doing the SHIELD fistbumps. That's it!